For the last few years, Joi Ito has been blogging about learning to dive with PADI. It wasn’t until I became certified as a diver myself that I really understood how much we can learn from PADI’s educational model. Here’s a summary of how PADI works, including ideas that we could apply to Webmaker. With Webmaker at the moment, we’re testing how to empower and train local learning centers to teach the web on an ongoing basis. This is why I’m quite interested in how other certification and learning & engagement models work. The Professional Association of Diving Instructors (PADI) has been around since the late 1960’s. It trained over 130,000 diving instructors to issue millions of learning certifications to divers around the world. Many instructors run their own local businesses, who’s main service is to rent out gear and run tours for certified divers, or to certify people learning how to dive. Through its certification service, PADI became the diving community’s de facto standard-bearer and educational hub. Nearly all diving equipment, training and best practices align with PADI. No doubt, PADI is a moneymaking machine. Every rung of their engagement ladder comes with a hefty price tag. Diving is not an access-for-all sport. For example, part of the PADI training is about learning how to make informed consumer choices about the dive equipment, which they will later sell to you. Nevertheless, I do think there is lots of learn from their economic and engagement model. PADI uses blended learning to certify its divers. They mix a multi-hour online theoretical part (regrettably, it’s just memorization) with several in-person skills trainings in the pool and open water. Divers pay a fee ($200-500) to access the learning materials and to work with an instructor. They also send you a physical kit with stickers, pamphlets and a logbook you can use on future dives. Dive instructors teach new divers in very small groups (mine was 1:1 to maximum of 1:3). It’s very hands-on and tailored to the learner’s pace. Nevertheless, it has a pretty tight script. The instructor has a checklist of things to teach in order to certify the learner, and you work through those quite methodically. The online theory complements the lessons in the water, although for my course they could’ve cut about 3 hours of video nerding out on dive equipment. There is room for instructor discretion and lots of local adaptation. For example, you are taught to understand local dive practices and conditions, like currents and visibility, which inform how you adapt the PADI international diving standard to your local dives. This gives the instructor some agency and adaptability. PADI makes its point of view very clear. Their best practices are so explicit, and oft-repeated, that as a learner you really internalize their perspective. In the water, you immediately flag any detraction from The PADI Way. Mainly, these mantras are for your own safety: breathe deeply and regularly, always dive with a buddy, etc. But by distilling their best practices so simply and embedding them deeply and regularly in the training, as a learner you become an advocate for these practices as well. The buddy system is particularly interesting. It automatically builds in peer learning and also responsibility for yourself and your buddy. You’re taught to rely on each other, not the dive instructor. You solve each others problems, and this helps you become empowered in the water. 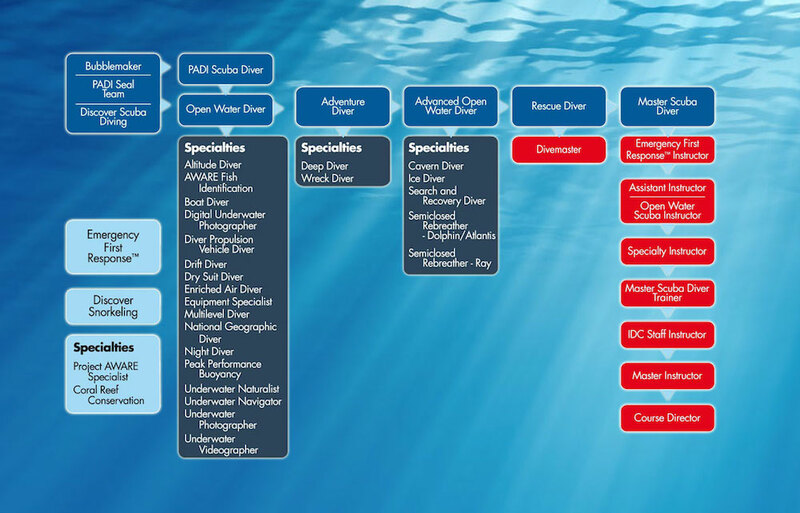 Furthermore, PADI makes its learning pathways very explicit and achievable. After doing one of the entry level certification, Open Water Diving, I feel intrigued to take on the next level and trying out some of the specializations, like cave diving and night diving. Throughout the course, you see glimpses of what is possible with further training. You can see more advanced skills and environments becoming unlocked as you gather more experience. The PADI system revolves around tiers of certifications unlocking gear and new kinds of dives, which they do a good job of making visible and appealing. What’s even more impressive is that the combination of the buddy/peer learning model and the clear pathways makes becoming an instructor seem achievable and aspirational—even when you just started learning. As a beginner diver, I already felt excited by the possibility of teaching others to dive. Becoming a PADI instructor seems cool and rewarding. And it feels very accessible within the educational offering: you share skills with your buddy; with time and experience, you can teach more skills and people. Speaking of instructors, PADI trains them in an interesting way as well. 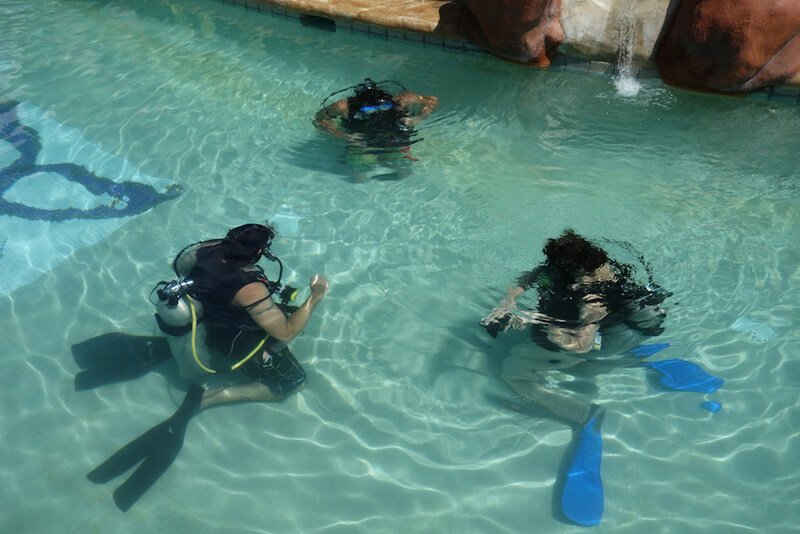 Like new divers, instructors are on a gamification path: you earn points for every diver you certify and for doing various activities in the community. With enough points, you qualify for select in-person instructor trainings or various gear promotions. Instructors are trained in the same model that they teach: it’s blended, with emphasis on in-person training with a small group of people. You observe a skill, then do it yourself, and then teach it. PADI flies about 100 instructors-to-be to a good dive destination and teaches them in-person for a week or so. Instructors pay for the flights and the training. At some point, you can earn enough points and training as an instructor that you can certify other instructors. This is the pinnacle of the PADI engagement ladder. We’re doing something similar with Webmaker: the top of the engagement ladder is a Webmaker Super Mentor. That’s someone who trains other mentors. It’s meta, and only appeals to a small subset of people, but it’s a very impactful group. What’s the role of PADI staff? This is a question we often ask ourselves in the Webmaker context. Mainly, PADI staff are administrators. Some will visit local dive centers to conduct quality control or write up new training modules. They are generally responsible for coordinating instructors and modeling PADI practices. The local diver centers and certified instructors are PADI’s distribution model. Divers go to a local shop to buy gear, take tours and trainings. The local shop is a source of economic revenue for the instructors and for PADI. As divers level up within the PADI system, they can access more gear and dive tours from these shops. Lastly, PADI imparts its learners with a sense of stewardship of the ocean. It empowers you in a new ecosystem and then teaches you to be an ambassador for it. You feel responsibility and care for the ocean, once you’ve experienced it in this new way. Importantly, this empowerment relies on experiential learning. You don’t feel it just by reading about the ocean. It’s qualitatively different to have seen the coral and sea turtles and schools of fish yourself. The theory and practice dives in the pool ready you for the stewardship. But you have to do a full dive, in the full glory of the open water, to really get it. I think this is hugely relevant for Webmaker as well: it’s all good to read about the value of the open web. But it’s not until you’re in the midst of exploring and making in the open web do you realize how important that ecosystem is. Real experience begets responsibility. PADI encourages several ways for you to give back and put your stewardship to use: pick up litter, do aquatic life surveys, teach others about the waters, etc. They show you that there is a community of divers that you are now a part of. It strikes a good balance between unlocking experiences for you personally and then showing you how you can act upon them to benefit a larger effort. As mentioned, there are many shortcomings to the PADI system. It’s always pay-to-play, it’s educational materials are closed and ridiculously not remixable, it’s not accessible in many parts of the world due to (understandable) environmental limitations. Advocacy for the ocean is a by-product of their offering, not its mission. Still, aspects of their economic and learning model are worth considering for other social enterprises. How can instructors make revenue so they can teach full-time and as a career? How can gear be taught and sold so that divers get quality equipment they know how to use? How can experiential learning be packaged so that you know the value of what you’re getting and skills along the way? 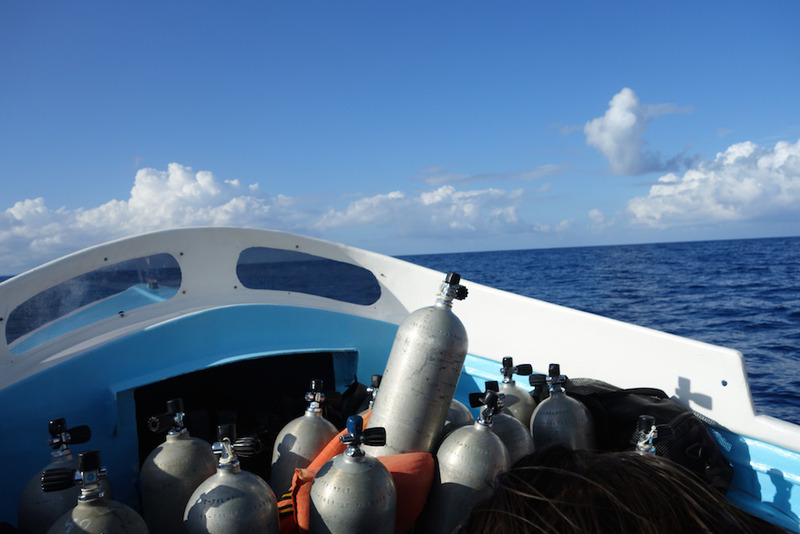 I’m pretty inspired by having experienced the PADI Open Water Diving certification process. In the coming months, I’d like to test and apply some of these practices to our local learning center model, the Webmaker Clubs. If you have more insights on how to do this, or other models worth looking at, share them here! PADI is often mocked in countries (mostly European) where diving instruction is done mostly by non-profit associations (under the CMAS) to mean “Pay And Dive Immediately”! Michelle, this is a very interesting and potentially inspiring model, although Fabrice is right to point out that it is as much an educational model as a money-making machine. But what seems more important is the difference between diving and webmaking. As much as we all want to believe the Websurfing fantasy, it’s just not as cool. There are no places you could go on holidays to spend a week webmaking for fun, and I don’t think there will be. So this fundamental difference in motivation is something I think you should look more carefully at – webmaking seems to have more to do either with vocational training, or some sort of civic duty / engagement. It all might boil down to the fact that diving is a market segment – webmaking is a non-market niche, at least for amateurs. One more thought, has anyone ever built upon the “badges” metaphor and looked more carefully at the whole scouting model?